1920s 4BR/1BA cottage with large rolling lawn and dock. Great for swimming, fishing and relaxing. 2 double beds and 3 twin beds. Lawn chairs and gas grill are there for your use. There is a bonfire pit by the lake for fires and s'mores. There is a great little beach bar on the lake and a nice restaurant and bar on the other end. And various shops and restaurants in Cuba, Olean and Ellicotville. Downtown Cuba is a quaint little town with shops, restaurants, antique stores and the world famous Cuba Cheese shoppe. 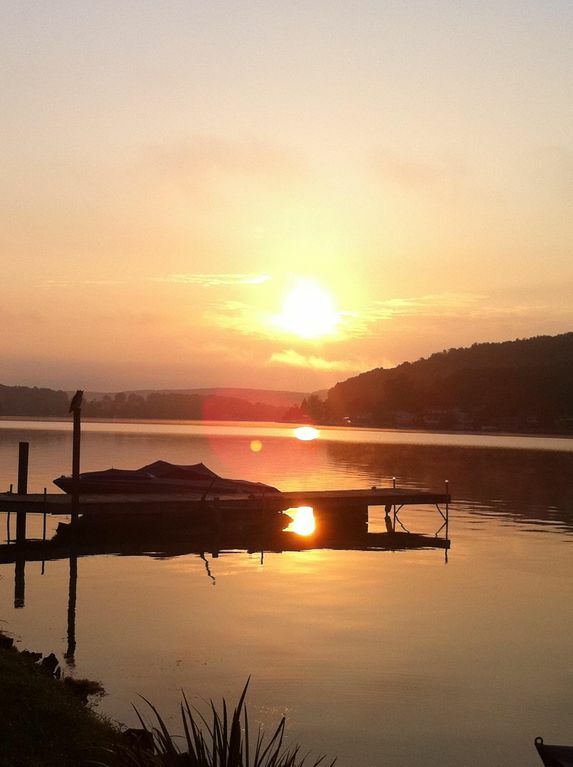 Cuba Lake is nestled in the Allegheny mountains and is surrounded by dairy farms and rolling hills. There is a great view of the lake from the enclosed front porch, one bedroom and the living room. This cottage is directly on the lake with a large lot and lots of green grass rolling down to the lake. Lake was great and owner was really nice, but..
We just didn’t find it very accommodating. The cottage itself is not in great shape, and it says it sleeps 11, however we had a very difficult time sleeping 8, putting people on couches. The biggest issue was the water. When you run the water, it smells like metal and really bad rotten eggs. The water is untreated well water and caused a few people with us who had sulphur allergies to get rashes and nausea. Sulfur can cause allergic reactions in some people and I was a bit surprised we werent notified prior. It was hard to feel comfortable there with exposed wires in the kitchen, and the top floor was taped off because of a bats. But again, owners were really nice, the lake was great, and it’s in a great section of NY. It was just unfortunate because we ended up booking 3 nights and left after only 2 nights due to the water situation. Owner said it was possibly a bad coil in the water heater and she called the Plummer, but the Plummer didn’t come by Sunday, so we left early. We are very sorry about several people having allergic reactions to our well water. We are refunding half of the rental amount even though the tenants stayed 2 of 3 nights. The plumber is addressing this issue now. This is an old comfortable cottage with lots of room for family. We enjoy staying at the 1920's cottage nothing fancy but a great place for kids and dogs. Thank you; we’re glad you enjoy Cuba Lake like our family has for 4 generations. We have great memories from our summer days there. I spent five days at this cottage with family and made some wonderful memories. We found it to be spacious and inviting with lots of historic charm. Although set back in time, the kitchen was fully functional. Bathroom was fully functional with newer toilet and pedestal sink. Clawfoot tub had curtain and shower. The large living area made for enjoyable relaxing indoors. The two eating areas (one in the dining room, one in the enclosed porch area) were very convenient. The large lawn between the cottage and the lake made for enjoyable relaxation and lawn games outdoors. Used the gas grill quite frequently. We brought our camp chairs and enjoyed a bon fire most every night. We brought some small boats and fishing gear. Just fished from our dock and did not have much luck, but it was fun anyway. It's a nice small lake and not intimidating for first time boaters. Much more quiet and calm than other lakes we have visited. Found some puzzles in the cottage for a rainy morning. Cable and internet worked well. Some of us had to walk to the shore to get phone service, but it was actually kind of nice not to have cell phones going off all the time indoors. Water has some sulfur in it - really only noticeable with the hot water - and I had to explain to my daughter that sulfur is actually a healthy thing and she was fine. Plenty of extras provided, such as dishsoap, salt and pepper, cooking spray, small bottles of shampoo, stack of clean dishcloths, towels, washcloths, cleaning supplies, beach towels, marshmallow sticks, lighters. Too many to mention them all. Owner's relatives live next door and were very helpful with whatever we needed. Staying in an older cottage makes for some great teachable moments for kids and also some great unique memories! If this is what you are looking for, I would definitely recommend it! Wonderful! So happy the weather cooperated so you could enjoy the lake. Thank you for the review and please come visit again. Cottage was beautiful with a perfect yard. We had a wonderful time & cant wait to rent again! Wonderful experience despite rainy weather!